Under the influence of globalization, firms review competition potentials. In the new world order where competition is very difficult, it is inevitable for companies to analyze the issues affecting their performance. In the traditional sense, looking at the balance sheet and income tables, only evaluating the profitability figures will not lead to the results that the firms want to see in their actual situation. It is essential that a number of instruments that are necessary for sustainable competition should be taken into account in performance evaluation. It will be possible for the resources to be correctly directed and transformed into the right sources, by evaluating the company's performance parameters in the modern sense. Firm performance is a vital issue that needs to be addressed with a holistic approach without ignoring both the internal environment and the external environment of the enterprises. Firm performance is a vital issue that needs to be handled with a holistic approach without ignoring both the internal environment and the external environment of the enterprises. The companies that recently announced concordat confirm this situation. Addison, J. T. (2005). The Determinants Of Firm Performance: Unions, Works Councils, And Employee Involvement/High‐Performance Work Practices. Scottish Journal of Political Economy, 52(3), 406-450. Barney, J. B., ve Clark, D. N. (2007). Resource-Based Theory: Creating and Sustaining Competitive Advantage. Oxford: Oxford University Press on Demand. Bharadwaj, A. S., Bharadwaj, S. G., ve Konsynski, B. R. (1999). Information Technology Effects on Firm Performance As Measured By Tobin's Q. Management science, 45(7), 1008-1024. Cai, W., ve Li, G. (2018). The Drivers of Eco-Innovation and Its Impact on Performance: Evidence from China. Journal of Cleaner Production, 176, 110-118.Chakravarthy, B. S. (1986). Measuring Strategic Performance. Strategic Management Journal, 7(5), 437-458. Chenhall, R. H. (1996). Strategies of Manufacturing Flexibility, Manufacturing Performance Measures and Organizational Performance: An Empirical Investigation. Integrated Manufacturing Systems, 7(5), 25-32. Cho, H. J., ve Pucik, V. (2005). Relationship Between Innovativeness, Quality, Growth, Profitability, and Market Value. Strategic Management Journal, 26(6), 555-575. Fornell, C., Johnson, M. D., Anderson, E. W., Cha, J., ve Bryant, B. E. (1996). The American Customer Satisfaction Index: Nature, Purpose, and Findings. The Journal of marketing, 7-18. Harris, L. C., ve Ogbonna, E. (2001). Strategic Human Resource Management, Market Orientation, And Organizational Performance. Journal of Business Research, 51(2), 157-166. Harter, J. K., Schmidt, F. L., ve Hayes, T. L. (2002). Business-Unit-Level Relationship Between Employee Satisfaction, Employee Engagement, And Business Outcomes: A Meta-Analysis. Journal of applied psychology, 87(2), 268. Johnson, R. A., ve Greening, D. W. (1999). The Effects of Corporate Governance and Institutional Ownership Types on Corporate Social Performance. Academy of management journal, 42(5), 564-576. Klomp, L., ve Van Leeuwen, G. (2001). Linking Innovation and Firm Performance: A New Approach. International Journal of the Economics of Business, 8(3), 343-364. Lenz, R. T. (1981). ‘Determinants’ of Organizational Performance: An Interdisciplinary Review. Strategic Management Journal, 2(2), 131-154. Lingaraja, K., Selvam, M., ve Vasanth, V. (2015). Long Run Dynamic Linkages Between Emerging Stock Markets in Asia and A Developed Stock Market (DJIA). Research Journal of Applied Sciences, 10(5), 203-211. Lusch, R. F., ve Laczniak, G. R. (1987). The Evolving Marketing Concept, Competitive Intensity and Organizational Performance. Journal of the Academy of Marketing Science, 15(3), 1-11. Miller, C. C., Glick, W. H., ve Cardinal, L. B. (2005). The Allocation of Prestigious Positions in Organizational Science: Accumulative Advantage, Sponsored Mobility, And Contest Mobility. Journal of Organizational Behavior, 26(5), 489-516. Mukherjee, D., Das, A., ve Garg, A. (2018). Impact of National Institutions on Corporate Social Performance. 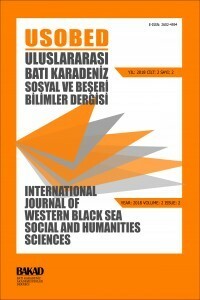 World Academy of Science, Engineering and Technology, International Journal of Humanities and Social Sciences, 5(1). Ramkumar, R. R., Selvam, M., Raja, M., Lingaraja, K., ve Vasanth, V. (2015). Efficiency of Sectoral Indices: A Comparative Study on BSE and NSE Ltd. International Business Management, 9(3), 258-266. Ramkumar, R. R., Selvam, M., Vanitha, S., Gayathri, J., ve Karpagam, V. (2012). An Analysis of Market Efficiency in Sectoral Indices: A Study Ith a Special Reference to Bombay Stock Exchange in India. European Journal of Scientific Research, 69(2), 290-297. Reimann, M., Schilke, O., ve Thomas, J. S. (2010). Customer Relationship Management and Firm Performance: The Mediating Role of Business Strategy. Journal of the Academy of Marketing Science, 38(3), 326-346. Santos, J. B., ve Brito, L. A. L. (2012). Toward A Subjective Measurement Model for Firm Performance. BAR-Brazilian Administration Review, 9(SPE), 95-117. Saylı, H., Veysel, A., Kızıldağ, D., ve UĞURLU, Y. (2009). Etik, Kurumsal İtibar ve Kurumsal Performans İlişkisini Belirlemeye Yönelik İlk 500 İşletme İçinde Yapılmış Bir Araştırma. Süleyman Demirel Üniversitesi İktisadi ve İdari Bilimler Fakültesi Dergisi, 14(2), 171-180. Selvam, M., Indhumathi, G., ve Lydia, J. (2012). Impact on Stock Price By The Inclusion to And Exclusion From CNX Nifty Index. Global Business Review, 13(1), 39-50. Swamidass, P. M., ve Newell, W. T. (1987). Manufacturing Strategy, Environmental Uncertainty and Performance: A Path Analytic Model. Management science, 33(4), 509-524. Tsay, T.-Y., ve Goo, Y.-J. (2006). The Relationship of Profitability and Growth with Stock Market Returns in the Electronics Industry. International Journal of Management, 23(4), 763. Vasanth, V., Selvam, M., Lingaraja, K., Miencha, I. O., ve Raja, M. (2015). Testing Environmental Kuznets Curve Hypothesis at Firm Level in India. Journal of Sustainable Development, 8(8), 201. Whetten, D. A. (1987). Organizational Growth and Decline Processes. Annual Review of Sociology, 13(1), 335-358. Wiklund, J., ve Shepherd, D. (2003). Knowledge‐Based Resources, Entrepreneurial Orientation, And the Performance of Small and Medium‐Sized Businesses. Strategic Management Journal, 24(13), 1307-1314. ISNAD ASLAN, Yakup . "FİRMA PERFORMANSINA DOĞRUDAN ETKİ EDEN PERFORMANS KALEMLERİ". Uluslararası Batı Karadeniz Sosyal ve Beşeri Bilimler Dergisi 2 / 2 (December 2019): 87-97.